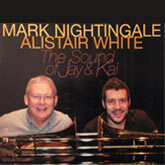 The result of a unique collaboration between multi-award-winning jazz musician and composer Alan Barnes and multi-award-winning playwright and jazz freak Alan Plater. In their mission statement, cobbled together in a bar in Birmingham, they say: "We want to write songs for the kind of people, places and institutions usually neglected by songwriters - for wonderful musicians like Joe Harriott and Sonny Criss - for great originals like Slim Gaillard and Spike Milligan- for local rhythm sections, jazz anoraks, RAC route maps and slobs who don't wash as often as they might." This is the UK sax and clarinet virtuoso Alan Barnes, with lyricist and playwright Alan Plater, on a collection of songs accompanied by a hellraising British octet fronted by singer Liz Fletcher. Plater is a witty writer, and the songs, one of which castigates the elevator-music vapidities of smooth-jazz are diverting enough. 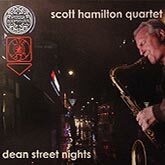 But it's hard not to feel that this fine band left to itself might not have made a more evocatively ambiguous job of conjuring up memories of Lester Young, Sonny Criss etc. Barnes is scaldingly brilliant, trumpeter Bruce Adams unleashes some mind-boggling Maynard Fergusonisms, and the whole ensemble rockets along. Liz Fletcher is a little demure, but those who enjoy a straightahead jazz/cabaret vibe with some fierce playing will get plenty out of it. Playwright Alan Plater's work is full of jazz characters and jazz references and he regularly escapes from his proper job to go touring with a bunch of musicians, telling tall stories in between the numbers. 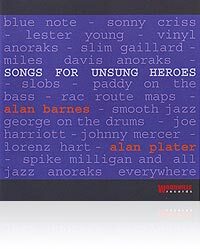 It was during one of these jaunts that Plater and saxophonist-composer Alan Barnes hatched this set of 13 songs about lost jazz heroes, old records, motorway cafes and their mutual dislike of 'dinner jazz'. Liz Fletcher sings them with great style and the band is packed with top players, such as trumpeter Bruce Adams, saxophonist Stan Sulzmann, trombonist Mark Nightingale and pianist Brian Dee.